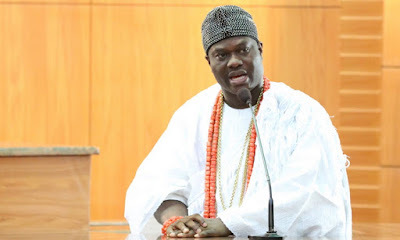 The Ooni of Ife, Oba Adeyeye Ogunwusi, has advised politicians in the country against violence and bloodletting as preparations for the 2019 general election begin to gather momentum. “I want to also advise Nigerian politicians and party supporters to refrain from promoting violence during the forthcoming elections because there is no gain in violence. Nobody’s blood should be shed on account of elections." According to a statement in Osogbo on Wednesday, Oba Ogunwusi gave this advice at his palace on Tuesday. Oba Ogunwusi, who is Co-Chairman of the National Council of Traditional Rulers of Nigeria, spoke while receiving hundreds of Muslims led by the Chief Imam of Ife land, Alhaji Abdulsemiu AbdulHammed, who had on their way from the praying ground visited the palace to pray for the monarch. The monarch, who later joined Muslims to pray at the praying ground to celebrate the Eid-el-Kabir, also advised politicians in Osun State against violence as political parties prepare for the September 22 governorship election in the state. He said the nation had lost so many promising persons to electoral violence while admonishing politicians to be law-abiding and shun violence in order to show to the world that Nigeria was ripe for democratic rule. He said, “The spirit of brotherhood being displayed by the faithful on a day like this is very laudable. At the Eid praying ground today, I saw politicians of opposing parties sitting side by side with one another relating together as brothers of the same womb in celebrating the Eid-el-Kabir, which we Yoruba people call Ileya festival. “I urge our politicians to apply this brotherhood when they get to the field of politics because that will help us in witnessing violence-free elections always. future and shun politicians who use them for violence to the detriment of their future."